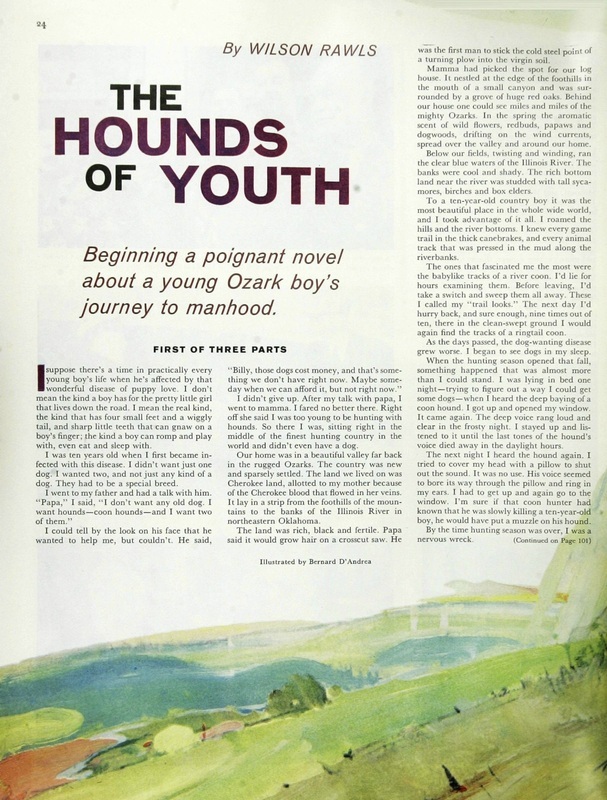 First published as a three-part serial under the title "The Hounds of Youth" in the Saturday Evening Post in 1961. Then published in hardcover by Doubleday under the title Where the Red Fern Grows in 1961. Although it came close in its early days of publication, Where the Red Fern Grows has never gone out of print. 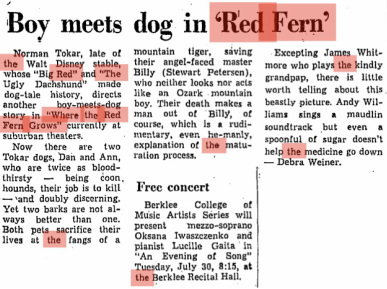 After a rough six or seven years of sales, author Wilson Rawls spoke at a teacher's convention at the University of Utah, which sparked the sales of Where the Red Fern Grows so drastically that a major motion adaptation was made in 1974 and several printings were put out thereafter . Garden City, N.Y.: Doubleday, 1961. New York, N.Y.: Bantam Books, 1974. Toronto: Bantam Books, 1974.New York: Doubleday, 1986. New York, N.Y.: Bantam Books, 1992. Santa Barbara, Calif.: Bantam Books, 1992. New York: Delacorte Press, 1996. Evanston, IL: McDougal Littell, 1997. 紅色羊齒草的故鄉 (Hong se yang chi cao di gu xiang). Taibei Shi: Minguo, 1989. 紅色羊齒草的故鄉 (Hong se yang chi cao di gu xiang). Taibei: Han Sheng, 1990. L'enfant qui chassait la nuit. [Paris]: Hachette jeunesse, 1998. Dan to an. [Japan]: Merkmal, 2001. Naeh oulduden Naeh leetul eh. Seoul: KCC Ung-jin-ju-ni-or, 2003. La leyenda del helecho rojo: una extraordinaria historia de amor y amistad entre un niño y sus dos fieles compañeros. Barcelona: Ediciones Obelisco, 2004. Current pricing: $6.29 paperback, $13.43 hardcover, $5.42 Kindle via Amazon as of Dec. 4, 2013. 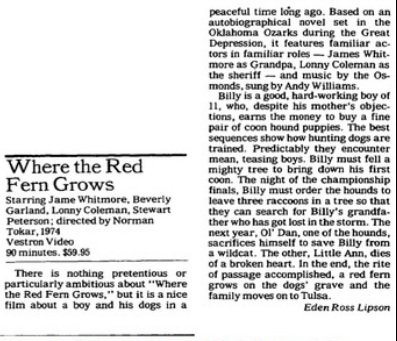 Few if any advertisements for the novel Where the Red Fern Grows exist. However, a fair amount of advertisements and reviews for the Disney movie adaptation are available, with subsequent book reviews coming after the movie's popularity. 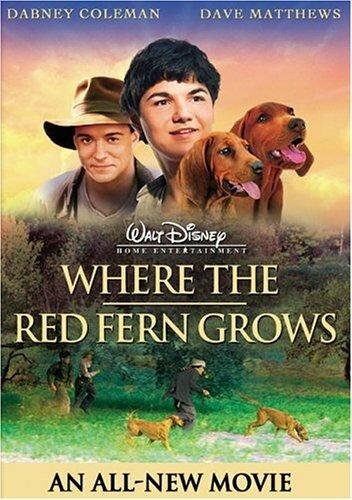 It is fair to assume that the movie adaptation of the novel Where the Red Fern Grows stayed true to the novel in overall plot line with a few possible "Hollywood" changes to make it better suit the big screen. Rawls, Wilson. "The Hounds Of Youth." 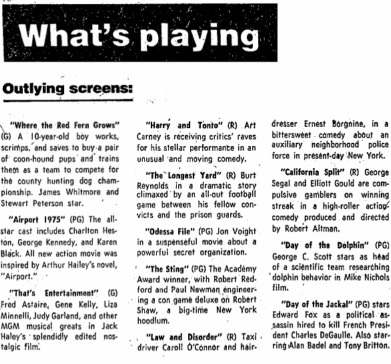 Saturday Evening Post 234.11 (1961): 24-106. Academic Search Premier. Web. 19 Nov. 2013. "Wilson Rawls." Authors and Artists for Young Adults. Vol. 21. Detroit: Gale, 1997.Biography in Context. Web. "(Woodrow) Wilson Rawls." Major Authors and Illustrators for Children and Young Adults. Detroit: Gale, 2002. Biography in Context. Web. 30 Nov. 2013. Major Authors and Illustrators for Children and Young Adults. Authors and Artists for Young Adults.